2. In a small pan, simmer your blueberries, a few drops of extract, and sugar until they thicken. Taste it often to make sure it’s as sweet as you like it. 3. 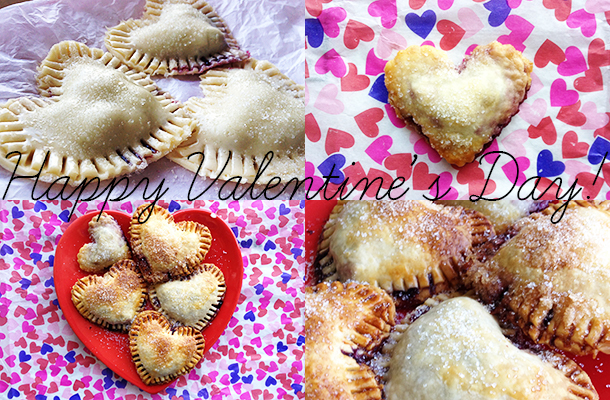 With your cookie cutters, cut heart shapes out of the premade pie crust. They should be cut in pairs (one piece for the top and one for the bottom). 4. 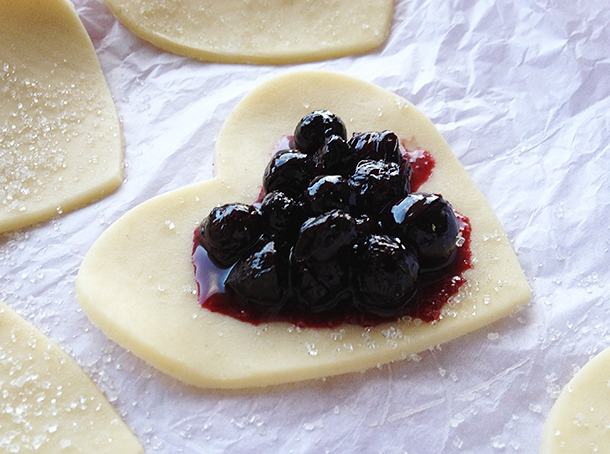 Place a small amount of blueberry filling on the center of a heart. Place another piece of heart on top and seal the edges with your fingers (or press them with a fork). 5. Brush a bit of egg white on top so they golden brown in the oven. 6. 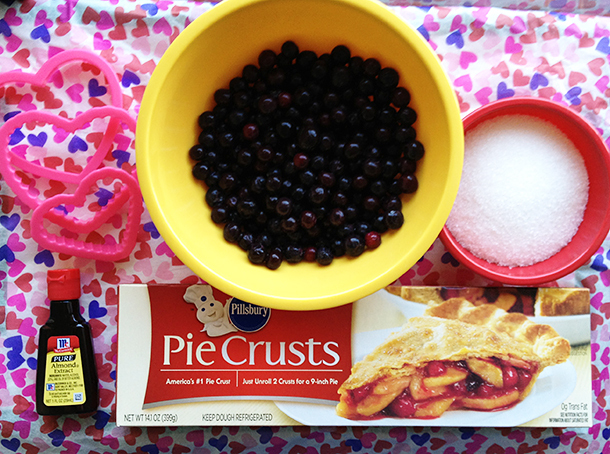 Place your mini pies in the oven. Check them after 7 minutes. Baking times vary depending on your oven, mine were ready in 14 minutes. Yummy! I always make sweet treats when I have to study! Hi, lovelies. I'm sorry but 3 people already asked and I've put their buttons up. Actually I ended up taking 5 offers for swaps and would love to take them all but I don't want to fill my sidebar with images. At least not now. Thank you for commenting though. And sorry again!! This looks so yummy, I should try it out! If you are still looking for someone to swap a button with. I'm interested! This is a good idea! thank you! Coco…those are making me wayyyy too hungry at my place of work hahaha. I am totally going to make these over the weekend! Maybe with raspberries? I will let you know of my (hopeful) success! These look AMAZING! Would you mind posting the recipe? Thanks! 🙂 I plan to try it out soon. Oh my these look so yummy! ah this make me want blueberry pie with ice cream now. My favorite dessert. I really like Pillsbury pie crusts! I use them to make buttertarts.